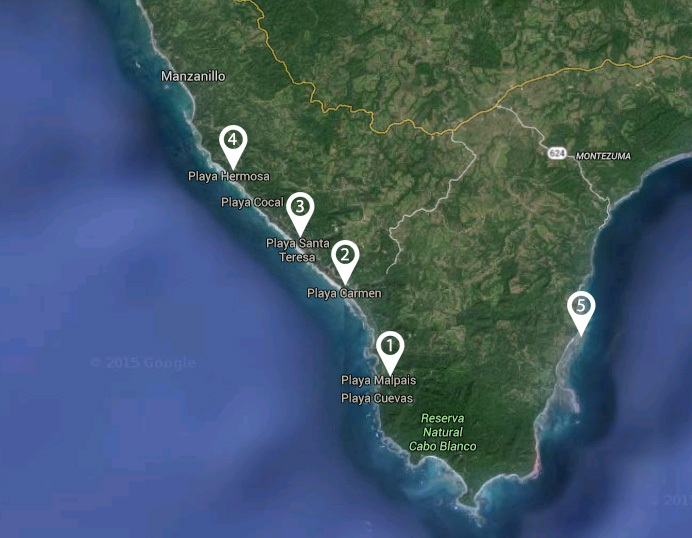 Mal Pais and Santa Teresa have consistent surf year round, excellent sand bars and pro level reef breaks. Our location is at a striking distance from all the top surf spots on both sides of the Peninsula. This guy posts short videos of the waves in Santa Teresa almost on a daily basis, check it out. Great high performance shortboard selection & accessories. Excellent for surfboard rentals and good selection of used surfboards on sale as well. This is where Pacific Azure is located, the distance from our accommodations to Playa Carmen the #2 pin drop is exactly 3.5km (a ten minute drive). Description: Playa Carmen is very consistent, it breaks literally all year round. The great thing about this beach break is that it's many peaks spread out along approximately 2km of sand. This is considered one of the softer waves in the area and is fun for both beginners and experienced surfers. It breaks throughout high and low tides although it's best on the higher tides. Crowd: Mellow but can get a bit busy during winter months (Dec - April). Ideal Wave Height: This spot works from knee high to over head. Once the swell exceeds a couple feet overhead it tends to shut down and is quite a bit of work to make it out to the lineup. X-Fator: Exposed rocks on the inside certain times of year. Nothing too critical but beginners keep your eyes open and find a spot clear of the rocks. Bonus: Playa Carmen can be well overhead and still A-Frame depending on swell direction. Barrel sections are out there too, just got to look for them. Playa Carmen, a very consistent beach break, pictured here is a perfect day early morning high tide. On high tide the inside can get super fun. Although Playa Carmen breaks on both low and high tides. Super fun sections on offer make it a perfect playground. 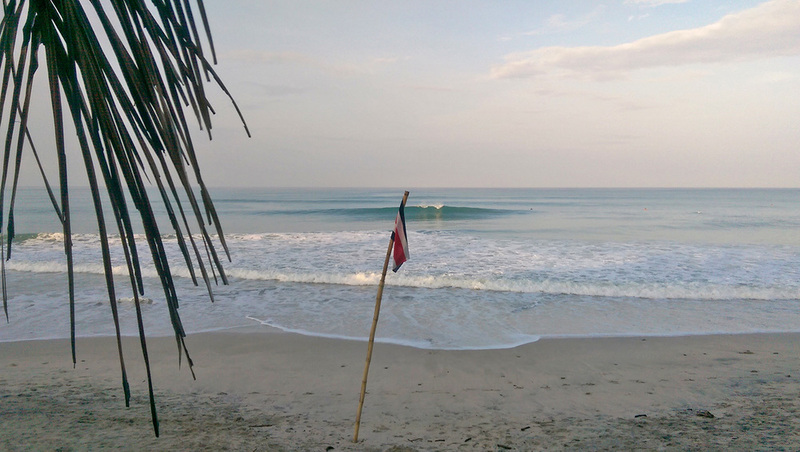 Description: La Lora is also a super consistent beach break. it's almost impossible to see this place go flat, it literally breaks 365 days a year. La Lora is a very bowly wave, that packs way more punch than Playa Carmen. On certain bigger days you'll see waves here that resemble Puerto Escondido. On small days and low tides it's a great beach for beginners to get some practice on the white water, but on big days it's definitely for the more experienced surfer. The great thing about La Lora is that there are many peaks to choose from and the beach can handle plenty surfers. Best a couple hours after dead low and incoming. Crowd: Definitely busier than Playa Carmen on the main peaks and the local boys love to surf here. The general rule of surf travel applies here as well, respect the locals and you will find them to be the friendliest people in the world. Drop in on them and you'll get a different set of reactions. Ideal Wave Height: This spot works from knee high to way over head. I have surfed if fun waist high and excellent when it's overhead and barreling. X-Fator: La Lora on overhead days is a solid beach break. The impact zone is board snapping material. Bonus: It can be a barrel festival. La Lora doing it's thing, as you can see it's a bit punchier than PLaya Carmen. Santa Teresa has several kilometers of excellent sand bars and tons of peaks to choose from. Description: Playa Hermosa (not to be mistaken with the one in Jaco) is located on the northern end of Santa Teresa and is in the same swell window, making it a very consistent beach break as well. The great thing about this beach break is that it's ideal for beginners and super fun for experienced surfers as well. On any given day you'll find several surf schools pushing their students on the inside into some fun surf. Have no worries, this is also a vast beach and has many peaks to choose from, the northern end of this beach has some rock formations that sometimes almost work like a north jetty. Overall super fun beach break. Crowd: Can get a bit busy with the surf schools on the inside but the outside is very spread out. X-Fator: Tends to shut down a bit more than it's neighboring beaches, but on the right day it fires. Bonus: Smile your in a poster perfect beach. Description: Lajas is a rock bottom river mouth that works almost like a perfect right hand point break. Because Lajas and Cedros are located on the other side of the Peninsula they tend to be more fickle. On mid size to large South swells both spots will break and can get very good. The great thing about these spots is that when the winds are onshore on the Mal Pais and Santa Teresa side you can find clean surf here. Lajas is best surfed on high tides mostly because you'll save your self the reef dance going and out of the water, but it is surfable on low tide as well. Crowd: Lajas can get very busy but it can handle the crowd since there are several take off zones. The same can not be said about Cedros. It can get busy as well but the take off zone is focused more one spot. Ideal Wave Height: Both spots that can be surfed from waist high to way overhead. X-Fator: On low tide be ready to do the reef dance at Lajas and on big South swells there is a good amount of rip current. Cedros is an easy in and out. Bonus: If it's big onshore and closed out in Mal Pais and Santa Teresa good chance you'll find some clean waves here. A small day at Playa Cedros, Cabuya.